"This (9/11) was all planned. This was a government-ordered operation. Bush personally signed the order. He personally authorized the attacks. He is guilty of treason and mass murder." The Reichstag fire was a disaster for Communists because they were blamed for starting it, but it was a dream come true for Hitler and his cohorts as it allowed them to transform Germany from a democracy into a dictatorship. Did the Bush administration attempt the same power grab on September 11, 2001? The victims of the 9/11 attacks have been disaster for Muslims because 19 Arabs were named as hijackers of the planes, but they've been a dream come true for the PNAC 'think-tank' whose 2000 Statement of Principles stated a "catastrophic and catalyzing event, like a new Pearl Harbor" would advance their policies, i.e. justify wars and "regime changes". ...so their statement actually referred to policy advancement through a governmentally orchestrated "catastrophic and catalyzing event" - Operation Northwoods is an example of this thinking. ...so were the events of 9/11 governmentally orchestrated? NORAD conducted exercises with fighter jets simulating hijacked planes flown into the World Trade Center in the two years before the attacks. Pentagon planners also envisioned the attack on the Pentagon five months before it happened. ...maybe that's why FEMA was in New York on September 10.
Who gave Odigo a two hour warning of the attacks? Why wasn't this warning passed on? How was it known that Bush was secure in Booker Elementary School during the attacks? How was it known that the World Trade Center was going to collapse? Why did explosions occur before the twin towers' collapses? Why did WTC 7 collapse? How did news media outlets know WTC 7 was going to collapse? Why has no-one been held accountable for the lack of military response on 9/11? Why did White House staff start taking Cipro on 9/11? Why did the Anthrax originate in the US? How did the White House know America was safe on September 12? Why was the World Trade Center collapse analysis "a half-baked farce"? If the "truss theory" is factual then how did WTC 1 remain standing after Flight 11's impact? Why were innocent Arabs named as hijackers? Why do pre-9/11 inside trades on AA and UA options lead to the highest ranks of the CIA? 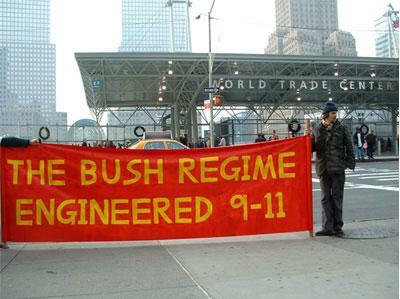 Why did Bush try to limit the 9/11 probe, starve it of funds, and obstruct investigations? Why were the conclusions of the 9/11 Commission based on false testimony and documents? "...there are all kinds of reasons we thought [the 9/11 Commission was] set up to fail. We got started late. We had a very short time frame, indeed we had to get it extended. We did not have enough money. They were afraid we were gonna hang somebody, that we would point the finger." All of the above cannot be dismissed as coincidental. PNAC demanded a "catastrophic and catalyzing event", they got it, and a cover-up ensued. The Nazis attempted to initiate a New World Order by burning the Reichstag, and it is apparent that an identical objective lay behind the 9/11 attacks. "I can hear you, the rest of the world hears you ... and the people who knocked these buildings down will hear all of us soon." ...and gave the US government the green light to start a pre-planned war in Afghanistan - how convenient it was that the head of the Northern Alliance was assassinated on September 9, 2001. The attacks also created a much needed enemy and the unread the USA Patriot Act stripped US citizens of liberties under the guise of fighting terrorism. 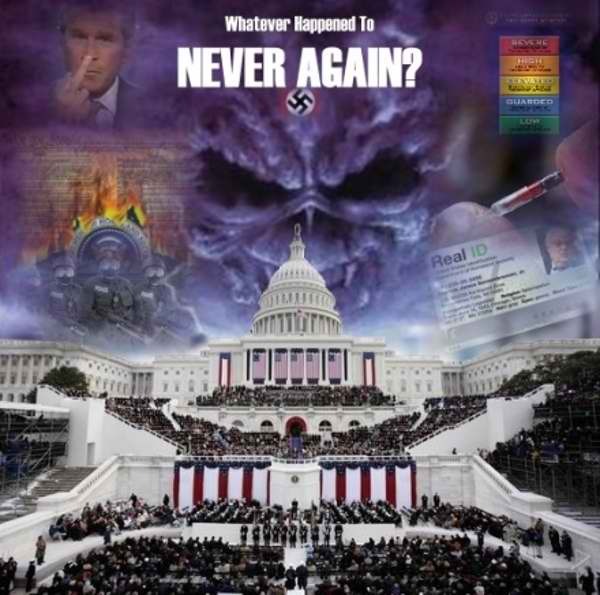 Watch this History Channel documentary excerpt detailing the burning of the Reichstag and note the parallels to today's 'War on Terror', then read these Bush family connections to 9/11 and dictatorship. Another 'al Qaeda' attack would result in America coming under military rule. 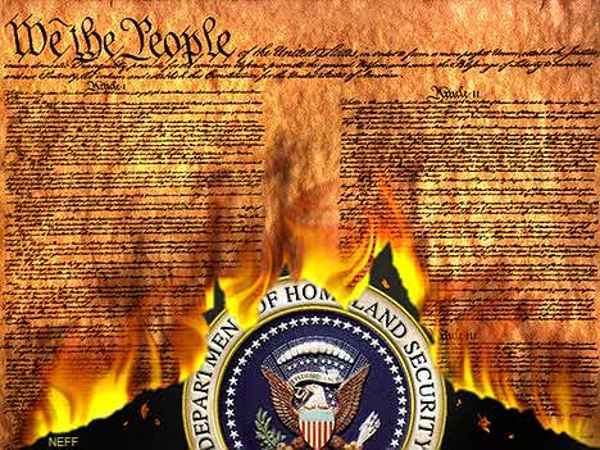 The Constitution of the United States would be consigned to history. PATRIOT Act II would become legislation - not nice. Plans for establishing civilian labor camps have been drafted and detention camps are being built. "Once a government is committed to the principle of silencing the voice of opposition, it has only one way to go, and that is down the path of increasingly repressive measures, until it becomes a source of terror to all its citizens and creates a country where everyone lives in fear." - President Harry S. Truman.